A compressed epic of the suffering, heroism, and determination that evinced itself in the Cuban refugee crisis of the 1990s—which in this translation carries heavy moral weight with intensely wrought, sometimes pedantic prose. Following the 1989 collapse of the Soviet bloc, living conditions in Cuba deteriorated rapidly, and a series of political crises (generally involving US-Cuban brinkmanship) culminated in the frantic attempts by Cuban rafters to reach Miami between 1993 and 1996 (and since then). 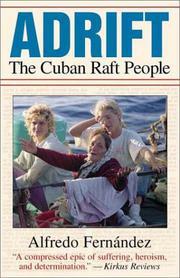 Fernández offers a terse but detailed narrative from within Cuba, capturing the desperate ingenuity of the Cuban people (both to build rafts, and merely to survive the post–’89 socialist privations), as well as the hoary treachery of the Castro regime (which constantly manipulated the rafters’ fates for political gain, first viciously attacking the refugees, then promising no interference to those who leave promptly). Although there were moments of both absurdity and triumph for the rafters, Fernández dwells on the horror: addressing the little-acknowledged fact that perhaps four times as many rafters died at sea as found land or rescuers, he narrates a long string of anecdotal suffering—typhoons, shark attacks, starvation, family members watching each other drown, and merciless “example-setting” killings by Cuban armed forces. Thankfully, Fernández also pulls back for the crucial global view, examining Castro’s long run, Cuba’s contentious relationship with other Latin American nations, and its perpetually worsening relations with the Clinton administration—culminating in the 1996 Cuban Air Force attack on the airborne exile group Brothers to the Rescue, and the punitive Helms-Burton Act that followed. The author’s portraits of these players and politicians, juxtaposed with details of the perpetually struggling Cubans, are laced with mordant irony. Fernández’s passions, the immediacy of his reportage from the battered Communist redoubt, and his understanding of the Cuban people’s willingness to risk all for better lives make this a substantial contribution to a thorny international debate.